Academics at Oxford University have taken a step towards handing financial control to outsiders. Vice-chancellor John Hood wants to change the 900-year-old tradition of its self-governing council and bring in external members to oversee finances. The university's ruling body adopted, by 652 votes to 507, a compromise amendment which could see the balance of power remain in internal hands. This makes it more likely Dr Hood will win the main vote later this month. During the two-hour debate in the Sheldonian Theatre, a letter from government funding chiefs was read out calling on those voting to back legislation for a "lay majority" - external members in control. The chief executive of the Higher Education Funding Council for England, David Eastwood, wrote: "In our view it is difficult to see how the standards for good governance can be met by any higher education institution without that body having an external majority on its executive governing body." The university says rapid financial growth demands more control. A university spokesman said: "Income and expenditure have doubled, research revenues have more than tripled, student numbers have grown by 20% and new departments and institutes have been established. "This diversity and dynamism has brought with it fresh challenges so Oxford needs the right framework in which to prosper and to maintain its reputation for excellence in all its activities." There are currently 25 members of the university council - including four lay members - responsible for both academic and financial matters. Dr Hood proposes to replace this with separate academic and financial boards. The financial board would have a slim majority from outside the university. His proposal is for the council to be composed of seven external and seven internal members plus a chairman - who would be the Chancellor, Lord Patten, for the first five years. After that, an existing external member of council becomes chairman. The amendment agreed on Tuesday makes it possible that the replacement council member could be an internal candidate. The university's ruling congregation of around 3,700 academics would make the decision. However, it is pointed out that the internal majority would include the vice-chancellor and the representative of Oxford's colleges - so, as things stand, Dr Hood would still have control. The amendment, brought by supporters of his, was backed by a majority of 145. Rebels now plan to oppose the whole amended plans when they are brought before the congregation once more on 28 November. The critics say that even if the extra place were granted to an internal member it would not alter the council substantially in their favour. Queen's College law fellow Nicholas Bamforth opposes Dr Hood's plans. "It will do nothing, absolutely nothing, to solve Oxford's main current problem which is that it needs more money," he said. He said the costs of the proposal outweighed any benefits and what Oxford really needed was for academics to take more control. 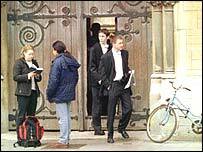 But Professor John Kay, a former director of the university's business school, said Oxford needed urgent changes to the way it was run. "What it doesn't have is professional management in a number of areas in which it needs it," he said. "For example, financial control has been missing for years - the new vice-chancellor has taken quite a lot of action to rectify that and quite a lot more needs to be taken."